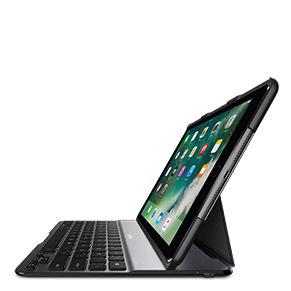 QODE™ Ultimate Lite Keyboard Case for iPad 9.7” 6th Generation (2018) is rated 4.6 out of 5 by 24. Rated 5 out of 5 by my ipad from Best keyboard and case Researched keyboard cases for new iPad. All other keyboard cases had some draw backs that caused me concerns. This product has met all my requirements, lightweight yet solid. 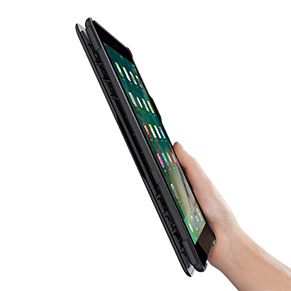 Holds the ipad securely. I would recommend this item. Rated 5 out of 5 by Belkin believer from Case is great protection I have been buying Belkin for years. I’ve tried other brands but they are not as well made and I like that the case goes all the way around the ipad - not just most of the way. The iPad is more secure if dropped, etc. I also like how easy it is to pair up the keyboard and the iPad - great if you are not particularly tech savvy. I just purchased two more for an older relative and I 15 year old. It works for everyone and is professional looking so I can take it to court with me. I’m a believer! Rated 5 out of 5 by katie from Boston from Great IPad protection After examining several alternative covers for the 6th generation IPad, this is far and away the most satisfactory. 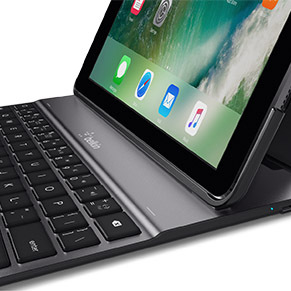 it is good quality with a hard back (Unlike several flimsy alternatives offered by other manufacturers),one-stop keyboard and easy installation. I couldn't be happier with my week-old purchase. The cover is virtually identical to one i used on an IPad Mini for 5 years. it appears unbreakable and likely to last for a long time. Excellent product. Rated 5 out of 5 by Jeanbean from Great quality, features and price! Bought this about a month ago. It was shipped and received the very next day. Best quality case and keyboard combo on the market. Rated 5 out of 5 by Freddy J from Another winner Even better then the original I bought in 2013 for my ipad2. That one has served me well and is still functioning. I think I charged the battery only 6 times since I got it in 2013. This is a great addition to anyone’s iPad. Your products rock. I know this one will be just as good. Thank you. Rated 5 out of 5 by frischster from Excellent Case! This my second case as my first one lasted several years! I love the Belkin brand. All of their products are of the highest quality and last a LONG time. I will always buy Belkin brands for all of my electronic cases!!! Rated 5 out of 5 by AjayB from The best cover and keyboard Highly recommend this product- glad its finally available. I Used the same case on an earlier generation iPad and waited to get this - absolutely worth the wait! Rated 5 out of 5 by Hannah3 from LOVE it! Light weight and protective This is the 3rd Belkin keyboard case I have bought. Love them because they really protect my iPad and is so handy. I have been using my iPad like a little laptop and also as a tablet. Seriously,though, is the customer service. Absolutely the best of any industry I have ever dealt with. They have been fabulous. They have always gone above and beyond my requests. The best! Thank you, Belkin! 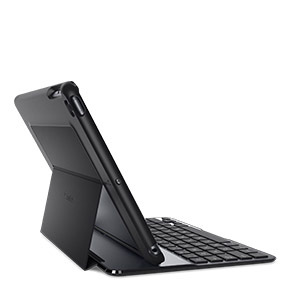 Rated 5 out of 5 by Bell51 from Perfect Match Great keyboard case for iPad. Not disappointed with purchase. Don’t hesitate to purchase for your iPad. Rated 5 out of 5 by thkzinc from Great Design Wonderful product. The rubber gasket on the back fell out which is a problem. Company repalced it for me at no cost. The newer version does not have a rubber gasket. This is a better design. Still, really enjoy this quality product. Rated 4 out of 5 by Dogzpaws from Takes some adjusting for good typers Bought this online so could not try it out in advance. Needed it for a new IPad (5th generation) which apparently is slightly different than the prior generations. Pros: The Bluetooth connection is almost immediate, much faster than other keyboards I’ve seen. The stainless steel appearance on the keyboard is attractive. The keys are very responsive and easy to type on for a keyboard this size. Cons: Most significant con is the moving of the semi-colon,colon key. Instead of putting next to L, the moved it to the right of the space bar. This moves the apostrophe key under your right pinky finger and the return key to where the apostrophe key should be. This is highly annoying - especially if you are good a typing. Especially bad when doing text messages when you go to use an apostrophe and instead hit the return key submitting your message. Note to Belkin - NOT A GOOD IDEA TO CHANGE A STANDARD KEYBOARD!. The outside of the case is black plastic, smooth on one side and slightly textured on the other. Not altogether impressed with the external looks and feel but acceptable. I’ve only been using for a week or so - time will tell if I can get used to the changed key pattern. Other than that, the keyboard is very functional and suitable for a business environment. Rated 5 out of 5 by Juniorha from Perfect ! Thin! Well made! Awesome! It was delivered on time! 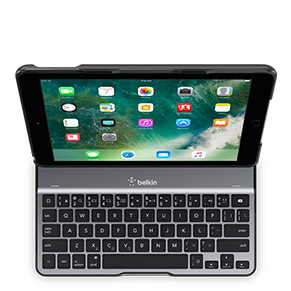 Rated 5 out of 5 by Jeff00 from Perfect accessory for new iPad I paid a little more for this keyboard/case than my previous keyboard/case and it is more than worth every penny. Love the magnets to hold the iPad in place and the response is excellent. Dedicated home button is also a must feature. Rated 5 out of 5 by dougnow from Excellent I love this case, works flawlessly. I use it for doing applications and the keyboard makes it a chinch.